In 1990 I had the opportunity to apprentice at the Vatican’s mosaic studio where I learned roman, byzantine and the ‘micromosaic’ in smalti filati technque.Mosaics, which according to Vasari, should imitate painting, have been utilized since 1600 by the Vatican studio to reproduce and replace the oil paintings in St Peter’s Basilica which have deteriorated over the years due to humidity.However, those mosaics which mimic a painting perfectly , lose the characteristics of the medium ,and in the end are , neither mosaic ,nor painting. A defining aspect of mosaic is its duration over time. “Truly, of all the endless things one can make with color, none withstand the shock of wind and water as does mosaic”.With these words Giorgio Vasari, a historian from1500, affirmed the long-lastingness of mosaic.Domenico Ghirlandaio, the painter in whose studio Michelangelo apprenticed, said “The true painting for the ages is mosaic”. It makes me think that to beautify his buildings or to make permanent those images that express his sentiments, man has looked for materials that would assure a certain longevity.The color that comes from a paintbrush is transient, and for all the ways we have found to make it more stable, such as the marvellous technique of Fresco painting , the technique of spreading it on fresh plaster ,so that , it can participate in the crystallization of the fresco, its fate is tied directly to that of the film of plaster applied to the wall and subsequently exposed to all manner of atmospheric conditions. Mosaic has always given the impression of stability, of solidity, of everlastingness. All the times i was involved in the restoration of mosaic pavements from a Roman villa dating to the 2nd century BC, and I can assure you that their state of conservation, despite being outside and exposed to the elements, was perfect. A synonym for mosaic, then, is duration over time. ”Far from being a spontaneous form of artistic expression, mosaic is the product of a rich and refined culture. Indeed, it first flourished within the cultural and geographical boundaries of the Greco-Roman world, along the Mediterranean basin. It is not coincidence that at the same time and in the same place, Platone (Plato), Socrate (Socrates) and Artistotele (Aristotle) were building the foundation of modern thought. In a mosaic, each piece is distinct yet it only makes sense as part of a whole; each piece has a unique position, and at the same time contributes to the overall composition. This is another concept crucial to mosaic: the part in relation to the whole, all the many tiny bits make up the whole.Even if all the bits are separated one from the other by the interstices. This leads to another thought: mosaic is a technique of fragmentation, you break up marble into ever smaller bits until you arrive at the desired form, that of the tessera.Then each tessera is reunited with all the others, to recreate the original design. Why is it necessary to break up marble into so many bits if afterwards one recombines them in a composition? Why is it necessary to do all this?Does this act of the mosaicist perhaps mean something else?Is mosaic a metaphor for something much greater?I am reminded of a myth from ancient Egypt. Being a myth it has no historical value, still it is interesting to reflect upon. It is a story of the loyalty and love that Isis, the queen of ancient Egypt, had for her husband Osiris,and the birth of their son Horus. Osiris was the king and Isis, his wife, was the queen. The king and queen loved each other and were well loved by the people.Osiris had a brother, Set, who was jealous of Osiris’ happiness and of the love Isis had for him. Set desired the adulation of the people and he wished to become king himself. So he decided to eliminate Osiris and he killed him, cutting his body into fourteen parts and throwing them in the river. Isis swam in the river , looking for her husband and gathered up, one by one, the fourteen pieces.Together with her sister, , she put them back together. At this point Osiris opened his eyes, but exhausted, he was unable to survive, and he died again. As Isis was leaving Osiris to his fate, she perceived that a son was growing inside of her , Horus. In a certain way , the antique art of Mosaic might , inconsciusly,repeat this marvellous mith.Returning to our discussion, the bit that constitutes the art of mosaic is the tessera: it is an element with a parallelepiped form, or a cube, approximately one centimeter square, that is, a geometric entity that is three-dimensional.Therefore you can’t treat it only as a surface; you must respect its volume and work accordingly.The resulting mosaic cannot be flat, but will have interstices and will possibly represent something not quite articulated,something as of yet unknown.This just might be the key. In the past, mosaics were always planned ahead of time, that is, a copy was to be made, or mosaic was to be used in the service of one of the ‘major’ arts. But if we manage to create something that isn’t defined, or only vaguely sensed, then perhaps in this way mosaic can become a MAJOR ART. In my opinion this has never been fully understood. Each time that mosaic has attempted to proclaim itself ART, its enormous conceptual and expressive potential has been suffocated at birth.As a consequence, mosaic has been reduced to mere covering, to merely reproducing painting or sheathing sculpture;it has always found itself in the SERVICE of the major arts-painting,sculpture, architecture-who have used it as a means for executing their own work.Painting as the master, mosaic as the workman.The EDICTUM DE PRETIIS of the Emperor Diocletian in 301 AD defined the various jobs and salaries of the people involved in the production of a mosaic. We Know that thePICTOR IMAGINARIUS was the artist who designed and painted the cartoon, and for this he was paid 175 sesterzi a day.The PICTOR PARIETARIUS,who transferred the design to scale on the wall or pavement, was paid 75 sesterzi a day. The MUSEARIUS, who actually executed the mosaic, received 60 sesterzi while the CALCIS COCTOR or LAPIDARIUS STRUCTOR, who prepared the foundation and spread out the lime bed, received 50 sesterzi. The fourth foundation layer, a thin layer of fine , white plaster( 8 mm thick), spread onto the NUCLEUS to serve as a setting bed for the tesserae. The last two layers were usually made with very fine limeand pozzolana,pozzolana is just a vulcanic sand that doesn’t have adhesive qualities, but when used with lime ,changes the features of the lime and converts from a non hidraulic to a hidraulic lime.This means that this new mortar can be installed even under water .Because of this special cement, roman architecture is so solid and it has survived 2000 years and arrived to us. The representation of the tessera in position is a purely mental operation, it takes form as a principle, as an idea, not really in its physical form. On the mental level the tessera is a fragment that separates itself from the whole, and on a lower level, the physical plane, it assumes the dimensions of a small cube.When you attempt to reassemble the whole, recombining the cubes on the physical plane, an ambiguity arises, because you aren’t working on the same levels.The ambiguity arises from the fact that you cannot recombine on a physical plane that which was broken apart on a mental plane, unless you are able to reassemble all of it on the mental plane, anticipating the crystallization.But ,this is ,an impossibile task,in fact , no one part must separets from the whole .In the same moment , when the part has left the whole ,it is already too late.The next process, the recombining of all the parts , is but a desperade and vain attempt to recover a lost unity. We will se shortly that , to compensate for this dramatic separation , the mosaicists of Alessandria in Egypt in II century a.C. ,would paint interstices . However, at this point, i must explain that while , the tessera as part ,and the mosaic as whole , the mosaic in turn becomes a simple tessera of an interconnected mechanical gears ,more complex and vast ,and every new whole becomes like a premise of a further development possibile and at the same time unimmaginable……….UP TO INFINITY. Metaphorycly speaking ,this chain – reaction is like if from each simple branch of a tree ,other branches , branch out .From this last branch , more branches , branch out , and this process never ends.So , the concept i express is , A PART in relation to THE WHOLE ,THE WHOLE is PART , OF OTHER WHOLES. This process ,in mosaic , AS AN ART ,must be without end.On a practical level it is this ambiguity that we try to address and solve, which takes us to the fundamental problem of the mosaic medium. How to express continuity of form when we must start from the discontinuity of the material?Mosaic cannot have the same continuity as say painting: the interstices interrupt. Then again, who said mosaic should have the same sort of continuity? The entire history of mosaic is rife with attempts to find ways to compensate for this interruption, for the fragmentation of the material, to succeed in creating an optical fusion, a progressive connection, such as happens in painting-and it is here where the ambiguity begins. Let’s stop for a moment and look at the pebble mosaics of the fifth century BC. During this period the mosaicists of Pella added thin strips of lead to Their pebble compositions, allowing them to delineate a figure or emphasize the lines of the face, creating an impression of graphic continuity that the pebbles alone would never be able to achieve. After the death of Alexander the Great in 323 BC we witness the diffusion Of Greek culture throughout the entire Mediterranean basin. This is the Hellenistic period, when the ‘emblemata’ first appear. For the first time mosaico were made in a workshop, not only on site. Emblemata are square mosaics, up to60 centimeters on a side; they were mounted on slate, clay or marble slabs,transported to the site and then installed in the middle of pavements that were produced on site. They were executed in the style called “Opus Vermiculatum” by the Romans, as it looks like teeming worms. The tessere were no larger than 2 or 3 millimeters thick.The invention of this technique represents another attempt in the effort to imitate painting.Having restored many emblematas , I can verify that the Greeks painted the interstices the same color as the surrounding marble, in an effort to conceal the discontinuity. It’s not a coincidence that they call Hellenistic mosaic ‘painting in stone’. Two thousand five hundred years ago, emblemata were precious and costly works of art and in contrast to mosaics created on site, they were even signed. The Musivarius, just as all other artists,aspired to celebrity and public recognition. This fact of signing their work indicates to us that emblematas were considered valuable works of art: collectors paid dearly for them, sometimes traded traded them with other collectors, and had them installed as the centrepiece of their floors. It represents a scene from a play by Menander. The quality of these two mosaics is apparent in its vast range of colors, the most sophisticated ‘painting in stone, I have ever seen from the Hellenistic period. The first time I saw this piece in the archeological museum in Naples, I was extremely moved and it immediately became a great inspiration to me in my work. (We can see other details of signatures by Hephaistion from the second century BC, in the Greek Hephaiston epoiei, shown as if written on a piece of parchment in the same mosaic, now in Berlin; and also Sophilos, in a portrait of the queen Berenice from the second century BC, now in the museum in Alessandria in Egypt. Apart from the images of these signatures, we know little of the mosaicista themselves. A bas-relief in Ostia shows two seated workmen, intent on cutting cubes with a hardie and hammer. Behind them their master, or perhaps the Pictor Imaginarius, indicates where a sack of material should be placed. Up until now we have spoken of Greek pavement mosaics. A decisive turning point in the evolution of mosaics takes place in the first century AD. The Romans built fountains and grottos (MUSAEA and NYMPHAEA) for the muses-divine protectors of the arts-and nymphs. These sanctuaries were places of repose, providing relief from the summer heat, a place where poets and philosophers could converse. To decorate them you couldn’t use paint, as it would deteriorate in the humidity; at first they were covered in shells, later tessere of cut glass were introduced, which gradually prevailed over all the other materials (again here we have an example of the search for longevity and durability). So for the first time mosaics covered the walls, giving rise to the name OPUS MUSIVUM which refers not to the form of the material but to its final destination. From their first primitive application in the NYMPHAEA, glass mosaic spread during the course of the first century AD to fountains, columns, pools, thermal baths and bath houses, fulfilling a very practical need. The glass mosaics were resistant to the action of water and maintained their brilliance, which was actually enhanced by water. From the second century on, mosaics made of glass paste were utilized in the decoration of walls and vaults in both public and private buildings, and above all in thermal baths. This new fact highlights the specific role OPUS MUSIVUM plays in respect to painting. As long as Greek-Roman mosaics were confined to pavements, and the paintings on walls and vaults were frescoes, there was no conflict between the media. When, however, the OPUS MUSIVUM challenged the spaces traditionally reserved for painting, it had to demonstrate advantages which would allow it to supplant its rival. The only technical advantage (that of resisting humidity) was not enough, its real advantage lay in its relationship to religious symbolism, in the area of the new Christian aesthetic. that all the many tiny pieces, inserted by the mosaicist to make the whole, acquire the property of reflecting light. Just as the heavenly bodies in space reflect the sun’s light ,the tessere give the impression every hour of the day of being sources of light themselves, and in fact, having absorbed the light, radiate it back out and can even illuminate a dark space. Anyone who has entered the tomb of Galla Placidia in Ravenna knows what I am talking about. “Whether born here or held prisoner here, in this place light reigns freely”. In contrast to the Greek and Roman pagan mosaics-executed as polychrome marble pavements, their emblemata with tessere less than 1 mm width and identified as ‘paintings in stone’-the Byzantine mosaics of the 5th and 6th centuries AD are distinguished by their religious character. The figures of Christ, Justinian, and Theodora in Ravenna appear static and inanimate, solemn, spiritual, their faces are cold and expressionless. The chiaroscuro of Greek-Roman mosaic gives way to the color of Byzantine mosaic. Beginning with the Justinian era (from 527 AD on) the hieratic art of Byzantine mosaic completely replaces painting on the walls of churches. Then, from the Renaissance on, the position reverses, mosaic ceases to be considered an autonomous means of artistic expression, and becomes simply a craft of technical virtuosity. Painting takes its revenge and uses mosaic merely as a technique for translation. In fact the painter no longer executes the mosaic, but avails himself of a craftsman who is limited to translating the painting or cartoon into a mosaic, and in this way underscores even more the difference between ART and CRAFT. In the central portal of St Mark’s Basilica there is a mosaic representing Saint Mark that is rarely noticed unless a guide mentions that the cartoon was done by Tiziano. Similarly in Rome, the cartoon for the mosaic in the church of San Paolo within the Walls, was drawn by Edward Burne Jones. These mosaics offer very little of interest because they are flat ,they imitate painting perfectly but they are, neither one , nor the other. They contribute to Vasari’s mistaken conception that mosaic, due to its long-lastingness, should imitate painting. And when around 1700, a Roman chemist Alessio Matteoli discovered how to Make opaque glass in hundreds of different colors, this new development was encouraged, supported and protected by the Reverenda Fabbrica di San Pietro , in Vatican. Matteoli’s discoveries are so jealously guarded by the Vatican that even today very few people are party to the secrets. It goes without saying that Matteoli’s discoveries are exceptional; it’s enough to realize that this same opaque glass created by him, when exposed toheat, transforms itself into a malleable substance and is easily drawn out into a thread. This allowed the creation of long thin rods less than a millimeter in dimension. 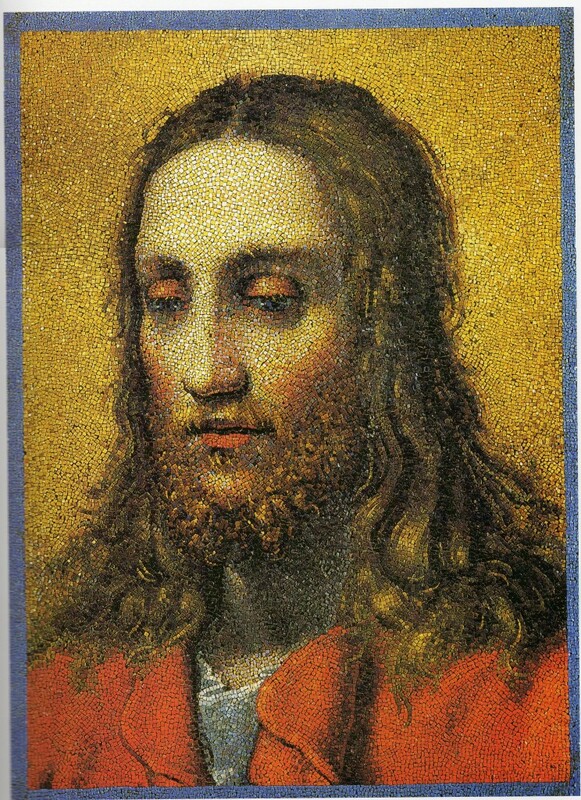 invented in 1770 the technique of micromosaic in smalti filati , glass threads. The so – called , FILATO. that of creating a ‘renaissance’ of the mosaic art. Instead mosaic was immediately relegated to a role inferior to that of painting, losing its specificity and its enormous potential. Indeed , at this time, jewelry and interior design used mosaics that became portable : brooches , necklaces, earrings , paperweights , tabletops ,now played host to the techniques of mosaic. The 16th and 17th centuries, coincided with the decoration of St Peter’s Basilica in the Vatican . All the images in the interior ,save one , are mosaics. Two examples stand for all the others, Raphael’s “The Transfiguration” and Lanfranco’s “St Peter at the Lake Tiberias”. The only image that is not a mosaic , is found on the central altar of the Chapel of the Holy Sacrament, in the right nave of the basilica, near Michelangelo’s “Pietà”. believe me, has yet understood this.I’ve read the last UNESCO’s most recent report stating that 70% of the world’s works of art are in Italy alone. This is despite the barbarian invasions and despite the theft of thousands of our works of art by Napoleon.We Italians are inured to our artworks, we live in a period bereft of spirituality, we are so accustomed to seeing the Colosseum, the Riace bronzes, the Ducal Palace in Urbino, the dome of St Peter’s, the Virgin Enthroned by Raphael, and i could go on………..that we no longer realize what we have; imagine what would happen should mosaic artists start to realize the potential of the ‘filato’ Many modern artists were influenced by the mosaics of Ravenna. Gustav Klimt, for example, passed a number of weeks in Ravenna and spent a great deal of time studying the gold backgrounds. It is no coincidence that his painting was greatly influenced by this experience.An artist who I feel is greatly undervalued in the history of mosaic art Is Georges Seurat. We all know Georges Seurat,he was at the forefront of the Neo-Impressionist movement.He wanted to make a science of painting and , to this end ,he studied the ‘laws of simultaneous contrast’ of the French physicist Chevreul, and the Textbook of Color by the American Ogden Rood.He banished ochre from the artist’s palette, the brushstrokes were separated, and each one of these was made so small as to become a mere point. The colors used were , above all , primary and secondary colors, and he worked with the contrast of colors. Seurat broke down the colors, and reaffirmed the identity of the paintbrush, treating the painting as a mosaic, each brushstroke as a tessera. From a conceptual point of view you can say he restored to the brushstroke (the tessera) its supremacy.All these are mental operations, seeing that to do this ,,an irony of fate , he actually used paint itself.The principles behind his work still need more elaboration, he has only sketched out some lines of inquiry that mosaicists of today might follow.Seurat intuited the possibilities of mosaic art without even realizing it. After his premature death in 1891 when only 32, Paul Signac took over the leading role among the Neo-Impressionists. What interested both Seurat and Signac about Impressionism was the translation of light; the objective in their painting was to obtain the maximum color and light. It is interesting to examine how Signac worked. He worked by division and contrast. Instead of mixing colors on the palette, he placed individual brushstrokes of pure color immediately adjacent to each other, which at a certain distance blend naturally , in the retina of the observer. Basically the colors mix not on the palette ,or the canvas, but directly in the observer’s eyes.The final result is an increased, vibrant luminosity;one only needs to step back a and these many-colored drops ,fuse into wavy luminous volumes.The workmanship of little dots , this uniform and impersonal execution that also had as a goal the elimination of the tricks of the hand ,disappears , and the eye is seduced by what is essentially painting.Signac, without even realizing it, had made a mosaic.In fact, fourteen centuries later, he had taken up the study of the reflection of light begun with the mosaics in Galla Placidia in the 5th century. Since the futurist Gino Severini (1883-1966), also a painter, is the next one to continue the work left interrupted by Seurat, it is interesting to note that it is always a painter who describes the autonomy of mosaic, never a mosaicist. It should be the contrary. In the history of art we have seen that mosaic and painting are in eternal conflict and have always been rivals. And yet ,no mosaicist has ever fought for the recognition of the autonomy of his discipline, no mosaicist has ever rebelled against his dependency on painting, it’s as if the mosaicist isn’t conscious, isn’t aware and, it’s the painter who must say :”wake up”.From his frequent citation of Seurat, we can see that Severini understood and shared both Seurat’s expressive message and his desire to study the science behind his art. Through Seurat, Severini the painter consciously arrived at an understanding that the individual pigment was magnified, exalted, when next to another pigment, and even more so when , part of a chorus of brilliant color.Practically the opposite of the seamless fusion of paint. Is this not a way to affirm the independence of mosaic? Isn’t this a way to make mosaic autonomous? Isn’t this a way to no longer subjugate mosaic to any other art? In addition, Severini maintained that one of the reasons for the decadence of mosaic ,is the separation between ART and CRAFT, the separation between he who paints the carton ,and ,he , who executes the mosaic.The cartoon should be made by the same person who carries out the work.For this reason he put forward the concept of the CARTONE PROGRESSIVO,the ‘progressive cartoon’, in which as the initial ideas of space and figure and tone evolve during the execution of the mosaic, the cartoon itself changes, in the end becoming a cartoon that reflects the actual work of art once the tessere have found their final arrangement.This is to say the TESSERE determine the CARTOON and not the other way around, it is the tesseras who have the final say.Not only is Severini able to combine the mosaicist and the painter in a single person (which gives equal value to the conceptual autonomy of MOSAIC as compared to ART, and to the MOSAICIST as compared to the ARTIST, (no small thing)but he also articulated the concept of the TESSERE’S AUTONOMY in regards to the artist himself. In fact, when he speaks of the tessere, he says, we must pay attention when an artist is speaking ,when he writes , he is explaining to the world his CONCEPT of art , his idea , his suffering ,and all these things make the difference between ART and CRAFT. For instance , if you look at the VAN GOGH painting , “ WHEAT FIELD WITH CROWS “ ,well , when you see that beautiful YELLOW, you immediatly think of Joy ,but, if you read the letters between VINCENT and his brother THEO ,when the artist talks about the YELLOW , he says that he uses that color to express the solitude , let’s come back to Severini , he says :”those little fragments of color that are the tessere (definitions are important, the tessere coincide with the individual brushstrokes) have their own autonomy, that goes beyond the actual cartoon, even sometimes going against it . . .”"concerning the unique chromatic effect (not always planned) of the tessere linked one to another on the surface, they take on a very precise individuality and ,almost, the power to decide themselves on the effect”.Practically speaking it is no longer the painter who commands themosaicist, it is no longer the new figure of mosaicist-artist who controls the cartoon, it is the TESSERA itself that emancipates itself from the artist.